Constance, “Connie,” and Haviland moved into Plymouth Harbor on July 22, and are fairly well-acclimated and happy with their new abode. They have lots of friends in Sarasota, having lived here since 2010, and have several friends who will be moving in shortly. Connie was born in Kensington, Maryland, and eventually graduated from the University of Connecticut with a BA in psychology. Her first job was with Arthur D. Little, a prominent consulting firm. Then, in 1966, she moved to The Hague and joined the Insurance Company of North America, where she eventually became Director of Planning for the European region. She moved with them to Brussels for the next 16 years. After the death of her father, she moved to Ocean Pines, Maryland, near Ocean City, where she and her partner formed a company providing financial services and managing condominiums. Next, she became CFO of Ocean Petroleum and while there, founded the Eastern Shore Performing Arts Society and co-founded the Mid-Atlantic Symphony Orchestra. 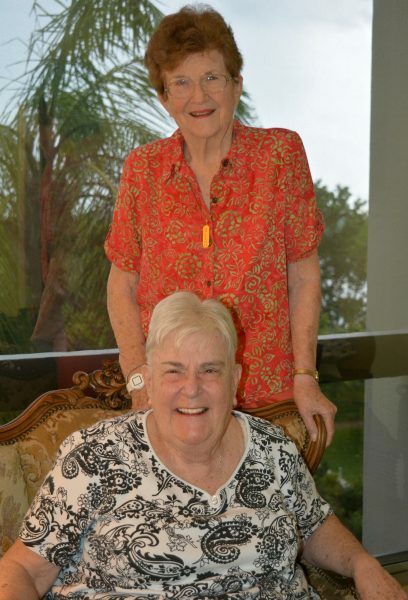 Retiring in 2000, she served on the Reader’s Advisory Committee of the Sarasota Herald Tribune and on the board of the Sarasota Concert Association and SILL (Sarasota Institute of Lifetime Learning). Haviland was born and raised in Fort Valley, Georgia. She graduated from Asbury University in Wilmore, Kentucky, with a BA in history and Spanish. After a brief stint teaching junior high school, she became Director of Christian Education in Savannah. Then she attended Emory University in Atlanta and received an MS in Christian Education. For the next 14 years, she was Director of Christian Education for the Peachtree Road United Methodist Church. Next, she became a recruiter of students for the nursing program at Emory. After that, she was an executive for the YWCA of Atlanta, followed by Assistant General Secretary of the General Board of Discipleship of the Methodist Church in Nashville, and then General Secretary of the General Board of Church and Society in Washington, DC. Last was a stint at the American Bible Society in New York. We welcome these accomplished ladies to Plymouth Harbor!